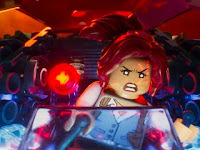 Following the unexpected success of The Lego Movie (2014), Warner Bros. Animation further capitalized on the Lego franchise by releasing the much hyped The Lego Batman Movie last week. The film puts the popular side character Lego Batman, an exaggerated version of the dark and brooding Batman of Christopher Nolan's trilogy, from the core film at the center of his own movie where he learns how to allow himself to become a part of a family again. The film is great fun and full of sharp comedic wit, however, it does fall just short of its predecessor in terms of overall quality. of a team, but a family. In The Lego Batman Movie, Batman (voiced by Will Arnett) enjoys solid success as the caped crusader consistently rescuing Gotham City in between his silent and lonely life as Bruce Wayne in the Wayne Manor. When the Joker (voiced by Zach Galifianakis) realizes that he isn't Batman's greatest enemy and Barbara Gordon (voiced by Rosario Dawson) takes over as Gotham City Commissioner with a plan for law enforcement to work in tandem with Batman, the DC hero finds his world turned upside down. All of this in addition to the fact that he's now accidentally become the adopted father to the optimistic and naive Richard Grayson aka Robin (voiced by Michael Cera). Batman must learn how to open himself up and become a team with Robin, Barbara, and his ever supportive butler, Alfred (voiced by Ralph Fiennes), in order to figure out the Joker's dastardly scheme and save Gotham City once more. Featuring the return of Will Arnett who again perfectly voices Batman, along with a stellar new voice cast, The Lego Batman Movie is a solid follow up to The Lego Movie. 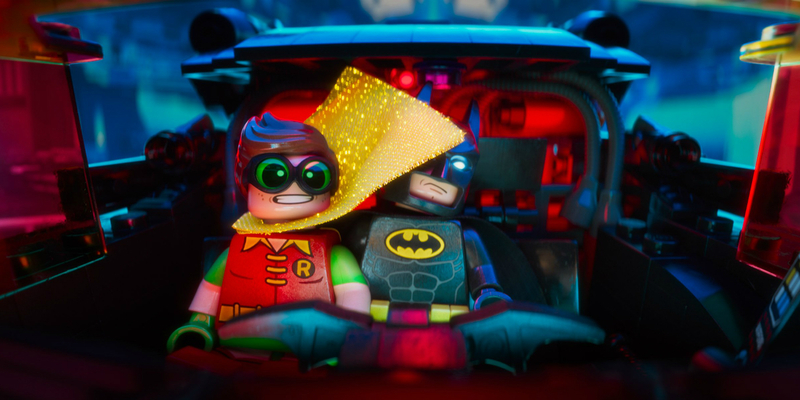 It does great work in showcasing the tongue in cheek comedy that made The Lego Movie so enjoyable while providing a heartwarming storyline and great quips to previous Batman films and series. While there is no unexpected twist that brings the film up an entire level as was done in The Lego Movie nor no connection to the previous film other than everything is made of Lego, The Lego Batman Movie still manages to stand on its own delighting audiences of all ages. The animation in the film is once again solid and even a step up from its predecessor, retaining that plastic Lego feel in a CG animated world. The world feels more realized and there are a plethora of characters and references that the movie will require multiple viewings in order to catch them all. It's a very active world chock full of detail that if you blink you're sure to miss out on something. The film has an upbeat soundtrack, including a few hilarious songs written by Batman himself, and while none of the songs are as catchy as "Everything is Awesome", they'll still manage to get a guffaw or toe tap out of you while you're in your theater seat. Definitely, expect Batman to break down some sick beats and be sure to stay through the first part of the credits for some upbeat musical fun! The Lego Batman Movie is hilarious and will have you rolling your belly with laughter from beginning to end while also warming your heart with a touching story about the importance of letting others in. While not as great or memorable as The Lego Movie, The Lego Batman Movie is still certainly worth seeing especially considering what else is out this week (50 Shades Darker...*shudder*). Make the right choice. Go see The Lego Batman Movie because Batman is awesome.